Each season, the Barkistas discover something they MUST have. 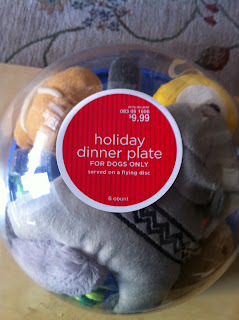 Luckily for us, we were able to get our paws on our latest lust-- Target's Doggy Holiday Dinner Plate! Despite the un-helpfulness of Target's corporate team and lack of local Targets, our awesome friend Diane was kind enough to pick us Paddy up a plate on one of her Target runs. Little did we know when we first spotted it in the pages of Food Network's November issue, there are actually three main dishes for your pooch to pick from: turkey, lobster and squirrel. 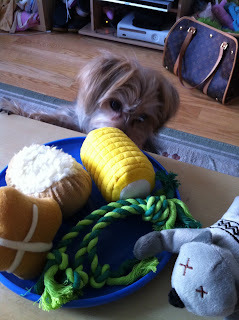 Diane snagged us the adorable squirrel plate which also includes a stuffed potato, piece of corn, bread roll, and a kale-esque rope toy. What to destroy... I mean...devour first.... Hmm. 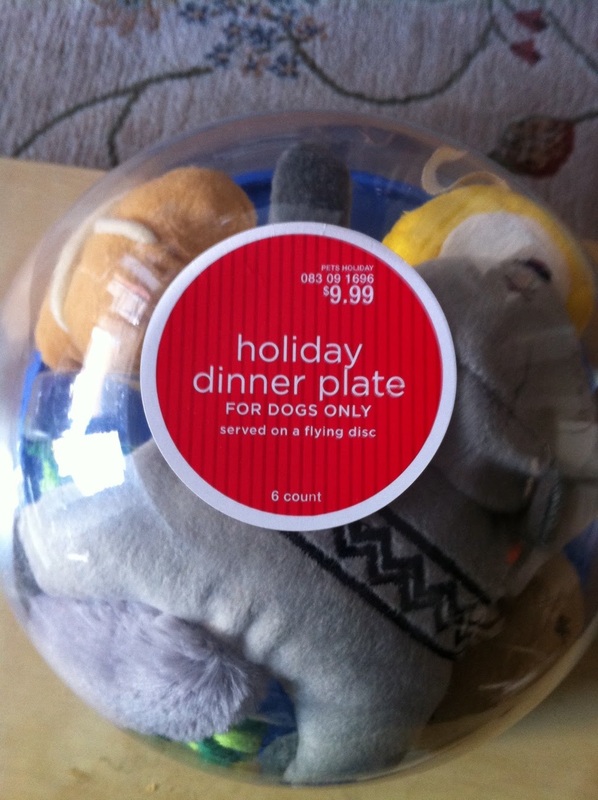 We were really delighted at the quality of all of the toys included, and while we don't think they're going to last long (listen, this is Paddy the Destroyer we're talking about here), they are super cute and for $9.99 the Holiday Dinner Plate is a pretty good deal. 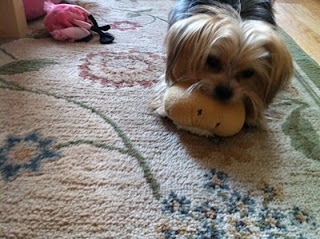 A girl after our own heart-- Paddy decides to start with the starch! 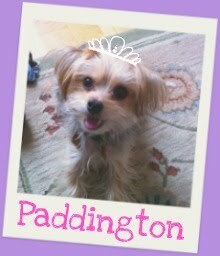 Though availability seems to be limited with some Barkzilla readers reporting stock (or lack of stock) at their Targets, definitely try checking out your local store as the set is NOT available online (BOOO!). Also-- if anyone's spotted the lobster plate, we'd love to see pics! So glad to see someone bought this. We haven't been able to find it at our local Target stores. SO FUN! 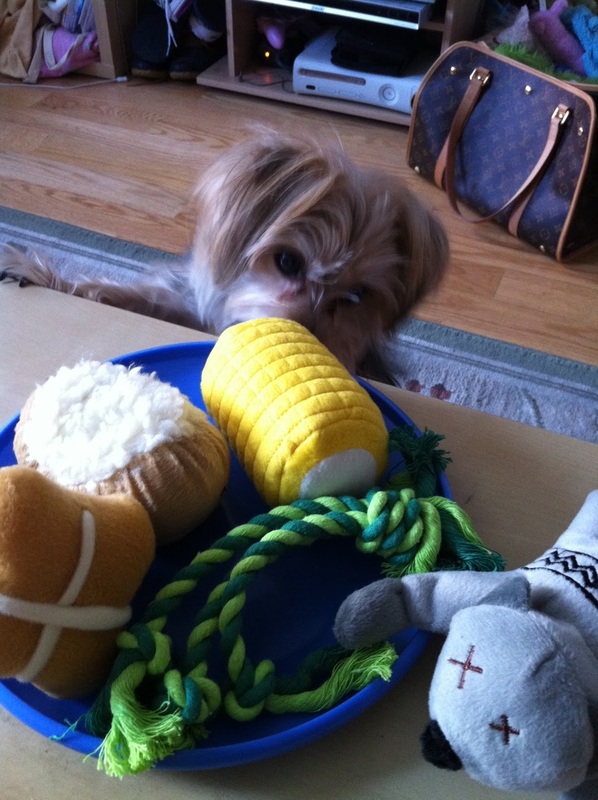 #ThursdayBling + Barkzilla = Sparkly Fun!